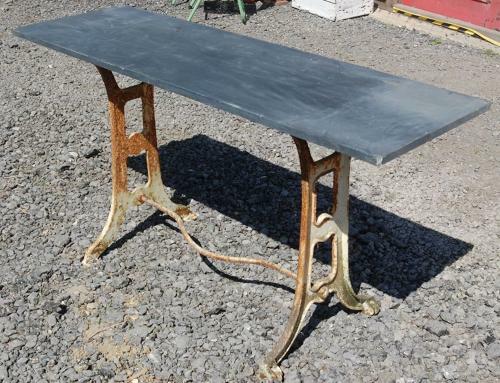 A lovely slate topped garden table with antique cast iron base. The table is constructed using a reclaimed slate slab that is placed on top of an antique Singer sewing machine base. The table is slim in size, making it ideal for use as a console table or small kitchen or garden table. The base has decorative legs with wheeled feet, a bar for a sewing machine pedal and the iron has been painted white. The slate top has been attached using wooden boards, with one attached to the base. The slate top is reclaimed and has character and a good colour. The table has been made using antique and reclaimed components and therefore has some signs of wear and use. The base has some rust, patina and chipping to the paint, giving a fantastic antique look to the table. The table top is solid but has signs of wear. There are some knocks and chips to the edges and corners. The top also has some scratches, marks and wear, please see pictures for details. The table is an attractive and interesting item with great character. The table has a rustic appearance and is ideal for a period or industrial home or garden. A desirable and pretty item.